If you want to make your bed as comfortable and supportive as possible, consider adding one of the best 3-inch latex mattress toppers. They offer several features that can help you sleep through the night without any aches and pains that will make you feel tired the next day. Once you decide that you want to spend money on one of the best latex mattress toppers, you will find that there are more options than you could have imagined. Don't let confusion deter you. Once you know a few things about latex, it's relatively easy to choose a mattress topper that fits your preferences. Before you commit to a 3-inch latex mattress topper, make sure it has these four features. There are all kinds of latex used to make mattress toppers. The best 3-inch latex mattress toppers, however, are almost always made from 100% natural latex. The topper may have a cover made of cotton, wool, or some other natural fiber... but the actual topper should be made of pure latex. There are several reasons. Natural latex usually feels softer than synthetic versions. It's also more durable, which means you could potentially use the topper for a decade or longer, depending on how well you take care of it. Natural latex even has hypoallergenic properties that make it a great option for people who have allergies. Dust mites, fungus, molds, and mildews have a very difficult time growing in natural latex. Synthetic versions don't always offer those levels of protection. Another big benefit: natural latex doesn't contain any synthetic chemicals. Some beds give off a chemical odor that can disturb sleepers. Even worse, those fumes could be harmful to your health. It's best to just choose the real thing and avoid that possibility. Latex is great at offering you a soft surface that also supportive. The right topper could end years of painful mornings. The qualities that make it so supportive, however, can also restrict air circulation. This is a problem for people who get hot when they sleep. A summer night spent on top of pure latex doesn't sound like a very pleasant experience. That's why many companies create designs that make their latex mattress toppers more breathable. A popular option involves making pinholes in the topper. This lets air circulate during the night instead of trapping it under your body. You should also look for breathable covers. Cotton covers are a good option. Bamboo is also an option that has been growing in popularity. Bamboo covers are surprisingly comfortable. There are two major types of natural latex used to make mattress tops. Although preferences differ, most people agree that Talalay latex is the softer version. Dunlop latex has a reputation for its sturdiness. If you're going to buy a mattress topper with just one layer, then you will probably get a better experience by choosing one made of Talalay latex. If you're going to buy one with two layers, look for one with Dunlop latex on the bottom and Talalay on top. This will give you stronger support while making sure you stay as comfortable as possible throughout the night. You should buy a mattress topper that is ever so slightly larger than your bed. Most companies will tell you whether the toppers are designed for twin, full, queen, or king beds. Unfortunately, not everyone agrees on how big those sizes are. A few inches too large or too small could make your latex mattress topper useless. If it's too big, it will slip around on your mattress. If it's too small, you probably won't be able to get it on. To avoid this, look for descriptions that tell you exactly how big the toppers are. You can then compare this to the measurements of your mattress. If they don't match pretty closely, then you should probably look for another option that's closer to the right size. Many of the best 3-inch latex mattress toppers cost a decent amount of money. They're not exceptionally expensive, but they cost enough that you want to make sure you choose an option that matches your preferences well. These reviews should help you decide which 3-inch latex mattress topper belongs in your home. The 100% natural latex mattress topper from OrganicTextiles has several good features that make it one of your best options. The mattress topper has a bamboo covering that is soft and easy to maintain. The topper also has a pinhole design that's an important part of air circulation that keeps sleepers cool on warm nights. 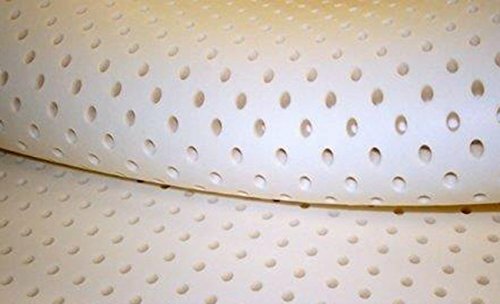 This latex mattress topper is 100% natural, so you get those antimicrobial, antifungal, and hypoallergenic properties that are so important to people with breathing and allergy problems. Plus, the natural material won't emit toxic gasses that could harm you or your family. The 3-inch topper is a popular option, but OrganicTextiles also offers a 2-inch and 6-inch version. Two inches could feel a little shallow for some people. With a six-inch latex topper, you might feel like you're floating half a foot above your bed. Apparently some people like that. ErgoSoft has a great 3-inch mattress topper made from 100% pure natural white latex. This material should give you the allergy and asthma protection you need to get a good night's sleep. As a natural material, it is also considered a "green alternative" to synthetic latex. This particular mattress topper was designed to have a somewhat soft feel. It's still supportive, but not as much as some other toppers. If you're primarily interested in getting an extremely supportive mattress topper, then you probably won't prefer this item. If you like a softer bed, though, it's wonderful. People who sleep on their sides or facing down seem to like it quite a lot. With the ErgoSoft latex mattress topper, you get air ventilation perforation that will keep your bed nice and dry during the night while keeping you cool for optimal rest. Natural Comfort offers a Talalay mattress pad that does not include any petroleum-based fillers or synthetic materials. The 3-inch thickness will help you stay comfortable, as will the pad's pin core ventilation technology, as Natural Comfort likes to call its air flow design. Unlike most mattress toppers, these air holes go all the way through. That should help your skin breathe at night. This latex mattress topper has a medium soft rating. It's a great compromise for people who want something halfway between soft and firm. It will give you plenty of support, but it will also let you snuggle into bed for rejuvenating sleep. Natural Comfort's mattress topper comes in four sizes. If you have a full, queen, California king, or twin XL, then Natural Comfort has a size that will fit your current mattress. This is more variety than a lot of companies offer. If you have a bed outside of this range, then you might have a difficult time finding a topper that matches your mattress. The three-inch natural latex mattress topper from Mattresses 4/7 has all of the features you would expect to see in a top product. It is made from completely natural materials without any fillers or synthetic materials. It has an open cell structure that's similar to the pinhole design used by many companies. The open cell structure seems to work just as well as the pinhole approach. This mattress topper is specifically made for people who want medium softness. That makes it useful for practically all types of sleepers. For some reason, people seem to like the queen size version of this latex mattress topper, but they don't have very high opinions of the king. Perhaps people with king size beds are just pickier than those with queens. Other sizes available from Mattresses 24/7 include twin, full, California king, full XL, and twin XL. That pretty covers the full range of possibilities unless you have a custom bed. This Talalay latex foam mattress pad from Tally-O has some real top-of-the-line features. It has a solid, 3-inch sheet of natural latex on the inside. This has been wrapped in a soft organic top that prevents it from skidding and gives you a little extra comfort. The Tally-O mattress pad is described as medium firm. From the description, it sounds like it runs a little on the firm side, though. This is a good option for people who like to sleep on their backs or stomachs. It could be slightly uncomfortable for light sleepers who prefer lying on their sides. Either way, it's a good product that obviously took some time to design.